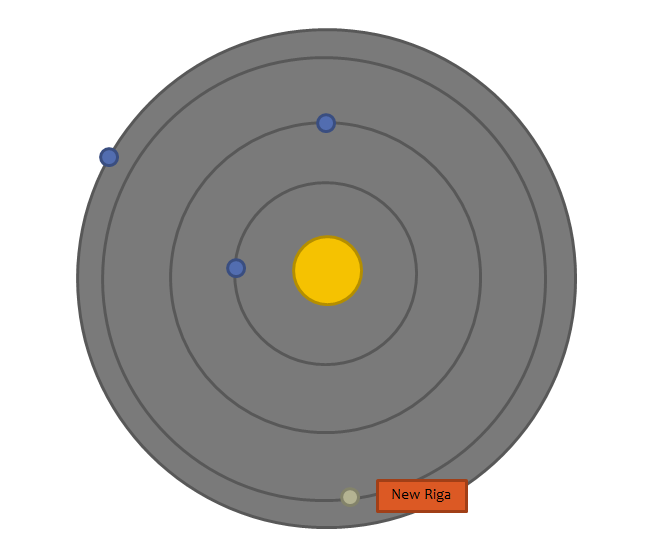 New Riga – The Agency Universe. New Riga is the name of a habitable planet and capital city belonging to the European Union in the Holum Majoris System. The settlement was established in the aftermath of the Pan-Eurasian War when Holum Majoris was a farflung and isolated location. The march of progress, however, soon caught up. By the Fourth Age, New Riga had transformed into a hub for trade and freight travelling between newer human colonies and the more developed Core Worlds. It is also close enough to old Illayko space to attract a number of expatriates. It was this importance as a centre of logistics and trade led it to be targeted in a Oroso counter-attack during the brief Union/Conclave conflict of the Third Age. The battle did not go the way of the ageing Union forces until the Caracals of Grendel Squadron arrived and snatched victory from the jaws of defeat. The effectiveness of the new strike fighters took everyone – Union admirals included – by surprise; the Oroso Conclave withdrew with the bulk of their forces. The armistice followed shortly after. Pingback: Story Part One | The Agency Universe. Pingback: The Union-Oroso Conflict | The Agency Universe. Pingback: Omicron Persei | The Agency Universe. Pingback: Hoversleds | The Agency Universe. Pingback: Predator Gunship | The Agency Universe.